A trip to All Alaska Outdoors Lodge allows you the amazing opportunity to experience just what the name claims: all Alaska outdoors! This premier lodge is not only one of the best Alaska fishing lodges but is also a prime hunting locale and wildlife viewing destination. Located on the shore of Longmere Lake on the breathtaking Kenai Peninsula, All Alaska Outdoors Lodge provides guests with incredible access to the regions best bodies of water. After a long day adventuring in the great Alaskan outdoors, it’s essential to be able to come back and relax in comfort. Our luxurious lodge and accommodations ensure that you will have an amazing and comfortable Alaska fishing experience. Here is more information on our high-quality lodge offerings! Our main lodge accommodations include two 1-bedroom suites and two 2-bedroom suites, all featuring beautiful waterfront vistas of Longmere Lake. With high ceilings and roomy dining and living areas, you will have plenty of space to relax and unwind. Each suite also has a full bathroom with immediate hot running water. Book your stay at the main lodge and experience the gorgeous and remote Alaskan wilderness while appreciating modern conveniences. Experience authentic Alaska fishing while staying in one of our remote log cabins. Our cabins are nestled into the surrounding wooded landscape and provide you with an excellent opportunity to become one with the majestic nature and wildlife. Just like the main lodge’s accommodations, both cabins are spacious and feature fantastic window views. For a more intimate stay, book one of the Lodge’s new studio accommodations. These smaller rooms include all of the same luxuries as the Main Lodge and Cabin suites and are ideal for one to two people. 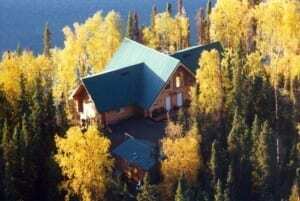 Enjoy comfortable living while on your amazing Alaska fishing or hunting excursion. The comfortable housing accommodations here at All Alaska Outdoors Lodge provide guests with needed relaxation after a day outdoors. Each studio, cabin, and main lodge suite features a fully equipped kitchen, daily maid service, satellite television, and free wireless internet. Whether you’ll be reeling in trophy fish, hunting some wild Alaskan game, or taking in the beautiful scenery and wildlife, a stay at our luxurious lodge will make you feel right at home. Make your way to All Alaska Outdoors Lodge and experience Alaska fishing and hunting like never before.